Yamaha R-N803D review | What Hi-Fi? You might find the current range of Yamaha two-channel equipment old-fashioned, but we prefer to think of it as winningly retro. Ultimately it’s a matter of taste, of course. We’ve always been suckers for big controls (and plenty of them), so we’re right behind the aesthetic of the R-N803D. If you prefer to keep things minimal, this Yamaha will have its work cut out to win you over. It’s a purposeful-looking device and there’s no getting around it. But even if you prefer to keep switches and buttons to a minimum, this Yamaha will lure you in with its extensive specification. Seldom have we encountered a network streamer/amplifier with such lavish functionality – especially at this relatively affordable price. The R-N803D covers all connectivity bases, from ancient to modern. On the rear panel, there are four analogue RCA line-level inputs and two corresponding pairs of outputs, plus RCA phono-stage inputs (and a grounding post) for a turntable. There is a pair of optical inputs alongside a pair of coaxial sockets, and an ethernet connection for hard-wired network stability. There is a DAB/FM radio aerial terminal, a pre-out for a powered subwoofer and terminals for two pairs of speakers. Up front, fighting for space amongst all those controls and the bright and legible display, are a headphone output socket and a USB input. Which is plenty of physical connections, we’re sure you’ll agree. The Yamaha is equally well appointed when it comes to less corporeal inputs. It’s packing Spotify, Tidal, Deezer, Qobuz, Juke! and Napster streaming services, is wi-fi- and DLNA-certified (with WAV, FLAC and DSD among the file types catered for), has AirPlay and Bluetooth wireless connectivity and Yamaha’s MusicCast multi-room functionality too. Internet radio is provided by Airable. Basically, if you don’t have a source the R-N803D can deal with, that’s very much your fault rather than Yamaha’s. All the digital inputs lead to an ESS Sabre 9006AS 24bit/192kHz DAC, so hi-res audio is firmly on the menu. Elsewhere, the R-N803D applies Yamaha’s ‘ToP-ART’ (Total Purity Audio Reproduction Technology, as you’re asking) concept, which calls for a symmetrical left/right circuit layout and the straightest, shortest signal paths possible. There’s a large, custom-made power transformer and a total of eight power transistors (four for each of the stereo channels). There’s a degree of automation to setting up the 803 that’s unusual in stereo products. Yamaha has equipped it with Yamaha Parametric Acoustic Optimiser (YPAO) – you get your money’s-worth of acronyms with this product. YPAO is a very useful mic-driven technology the company’s been equipping its home cinema amplifiers with for a long time – it measures room characteristics in a quest for the ideal balance and sonic quality. It works well on five-, seven- or more-channel home cinema amps – but we find the R-N803D performs at its best when our speakers are toed in towards our listening position just a touch and slightly further away from our listening position than they are from each other. Which is exactly how it is with 99 per cent of the stereo equipment we test, none of which has YPAO circuitry on board. Operation is via the numerous fascia controls, an equally overburdened remote control wand (you’re advised to keep a cocktail stick handy, so small are some of the buttons) or via the reasonably fast, reasonably intuitive and mercifully uncrashy MusicCast app for iOS or Android. We start by testing the Yamaha’s over-air performance. We dip into the What Hi-Fi? playlist on Tidal, and play Brighton Gallows by The Great Park – a fine tester of midrange fidelity and detail in particular. The R-N803D proves adept, giving ample expression to the close-mic’d vocal and describing the intensity of each guitar-strum explicitly. There’s pleasing openness to the Yamaha’s presentation, too. Given this is a spare and spacious recording featuring just voice and guitar, though, there’s a slightly concerning lack of coherence to the sound – rather than one man singing and playing, there’s the suggestion of two performers doing their thing quite independently. Our forebodings regarding the Yamaha’s way with timing are given greater expression when we switch to a 24-bit/192kHz file of Van Morrison’s And It Stoned Me. Hard-wired to our router, the R-N803D has no trouble handing over all of the details of the arrangement and the unlikely soulfulness of the vocal – and there’s pleasant warmth to the alto and tenor saxophones. But there’s a shortage of unity to the presentation – again, the sound comprises distinct elements but not a great enough sense of a band as a single entity. Tying together musical threads to form a cogent whole is not a strength here. Switching to physical inputs only compounds the impression of a machine well able to deal with the nuance of a single instrument or the character of a singer but not adept at marrying them together. Even four-square and repetitive CD-borne grooves like Mogwai’s Party In The Dark or Prince’s Girls & Boys can’t quite unite, their rhythms hesitant and club-footed. Songs like this, when delivered by the Yamaha, sound like neighbours rather than housemates. The on-board phono stage plays to vinyl’s inherent strengths – the warmth we notice from the off is positively toasty when listening to Jimmy Smith’s The Cat on LP. But for all the format’s languid charms, the Yamaha still can’t quite extract a convincing facsimile of an all-round-the-same-mic ensemble performance. For a product with such a smooth and balanced overall tonality, its lumpy way with timing is frustrating. Throughout the frequency range, the Yamaha errs on the side of caution – and we think that’s an entirely sensible move. Low frequencies are decently weighty, tonally expressive and don’t overhang too much, while at the opposite end of the range, treble sounds shine benignly without suggesting they might get troublesome. The R-N803D is forgiving enough in this respect to pair happily with a wide range of speakers, both in terms of character and price. All hi-fi is a compromise to some extent but the question for potential suitors is how far are you prepared to compromise? 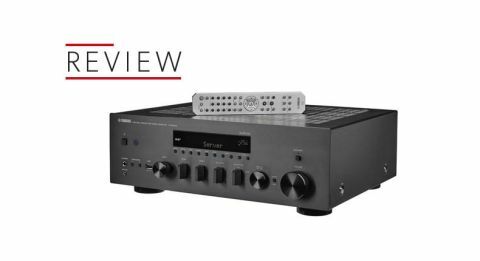 Yes, the Yamaha's timing isn't as accurate as we'd like but it's still a generously specified, detailed network receiver with an engagingly smooth and warm sound. The least it deserves is an audition.